... this morning was Great Barrier Airlines BN Islander ZK-FVD after its repaint and major overhaul... It looked quite smart. Another machine to photograph! 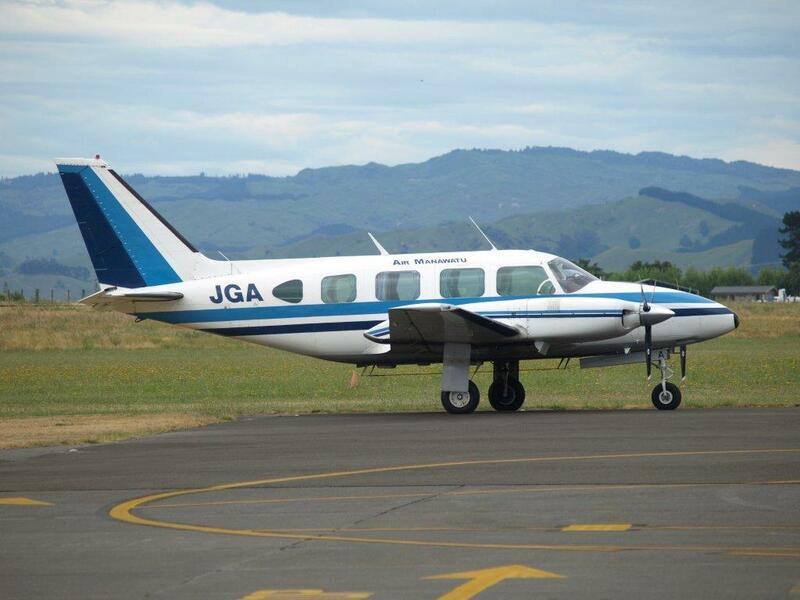 Air Manawatu's Piper Navajo ZK-JGA is sporting a new colour scheme. 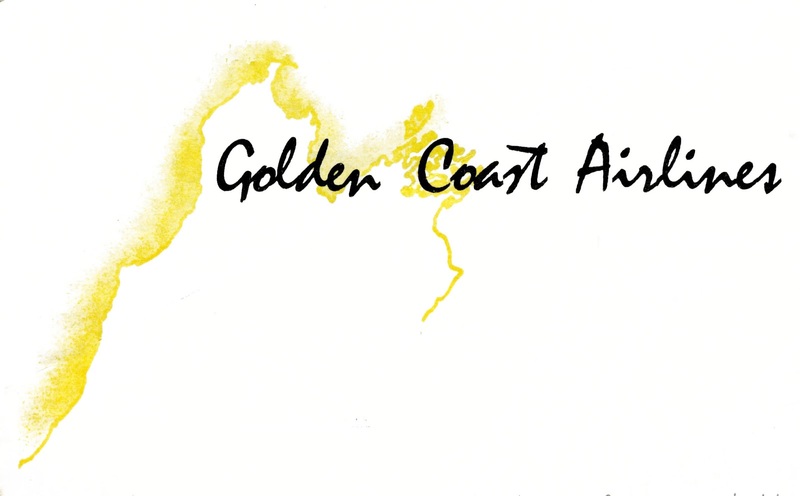 JGA was originally imported into the country for Goldfields Air. It did airline service for Goldfields (http://3rdlevelnz.blogspot.com/2010/09/goldfields-air-alexandras-airline.html), Coast Air (http://3rdlevelnz.blogspot.com/2010/07/coast-air-part-2.html), Air Nelson, Air New Zealand Link and Air Marlborough before going to Air Manawatu for charter and air ambulance work. Air New Zealand has not decided whether to maintain its increased flight schedule to Wanaka. Eagle Air acting general manager Stuart McIntosh told the Wanaka Sun that they have not made a decision and there no definitive date to make the decision. Meanwhile I note, the Air New Zealand website shows the increased schedule through to the end of the year. From the end of August last year the Christchurch-Wanaka flights were increased from a daily flight to twice daily on Mondays, Wedensdays and Fridays. 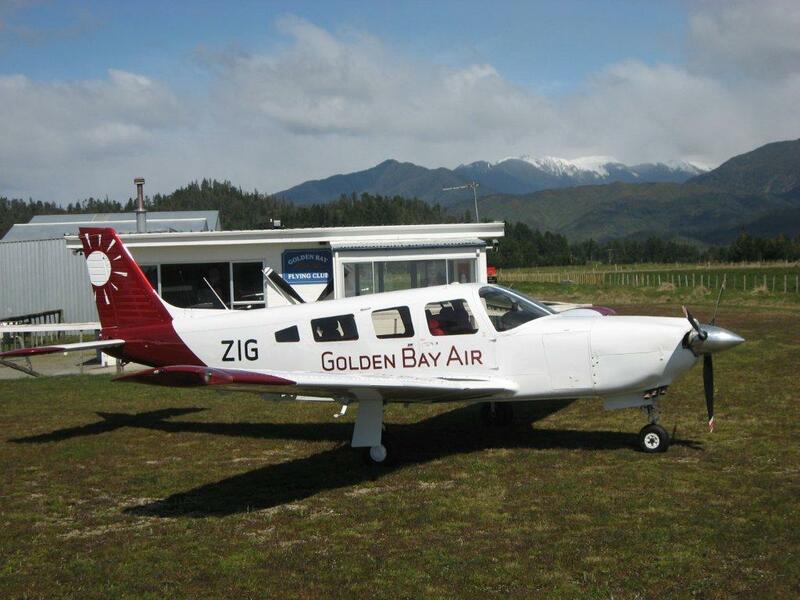 Wanaka also has a second flight on Sundays during the winter. Air New Zealand new Paraparaumu flights on sale from today. Air New Zealand today announced that its new direct flights between Paraparaumu and Auckland are available for purchase. The new route, offering 18 return services a week, will be operated by Air Nelson, a subsidiary of Air New Zealand , utilising its fleet of 50-seat Bombardier Q300 aircraft. Tickets are on sale from today, for the new flights which start from Tuesday 25 October. To celebrate the new route Air New Zealand has a special introductory price of $79 available until close of play Friday, for travel between 25 October and 21 December. Air Nelson General Manager Grant Kerr said he was thrilled to expand the regional airline’s network to include Paraparaumu, taking Air New Zealand ’s domestic network to 27 destinations. “We’re expecting the daily services to see strong interest from both business and leisure travellers throughout the Kapiti Coast ,” says Mr Kerr. Air Nelson will operate three return services per day (Monday – Friday) and another three return weekend services. “The new weekday schedule has been designed to meet the needs of business travellers from the Kapiti Coast , as well as providing connections to international services out of Auckland ,” says Mr Kerr. 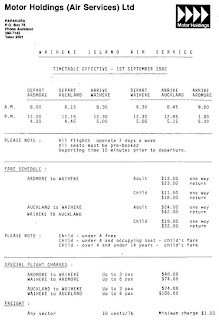 “With three return flights each day, the schedule provides travellers with choice of travel at both peak and off-peak times throughout the day.” Standard lead-in online fares between Paraparaumu and Auckland are available from $94 one way at www.airnewzealand.co.nz, with fares to and from other points around New Zealand also available. Paraparaumu Airport's new $3 million runway was christened last week. Work on resealing the runway started on March 14 and was completed late last week, paving the way for a new Air New Zealand service to Auckland, scheduled to take off during Labour Weekend. Mrs McDonald, a Kapiti Aero Club and Paraparaumu Aviation Museum life member, used to fly from Nelson to Paraparaumu in the 1940s, and commended the new runway for being "so smooth". 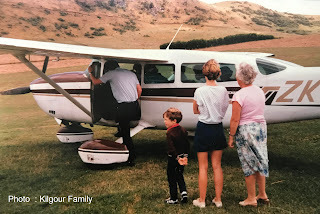 Wearing a scarf given to her by the first patron of Kapiti Aero Club about 1953, she found being taken for a spin around Kapiti Island in the Partenavia plane on Thursday rekindled her passion for flying and brought memories flooding back. "I can't smell the fumes and not want to be flying the plane myself. I want to do more - I will have to rob a few houses." She hoped the thrill of the flight would encourage Air Training Corps cadet Kylie to join the New Zealand Air Women's Association. It was only Kylie's second flight. She said it was "really fun", although landing was "a bit freaky". Wayne Grant captured today the arrival in Auckland of Airwork's new Boeing 737, N919GF, which will become ZK-TLE. Wayne writes, Conditions couldn't have been much worse for its arrival at 16.55 and yet as soon as it landed the rain stopped and sun came out but thats AKL for you. In 1968 there had been a major downturn in New Zealand's farming and Rex Aviation (NZ) Ltd had a large stock of unsold aircraft. Boardroom struggles eventually saw Miles King and New Zealand shareholders lose control of the company which passed to Australia. 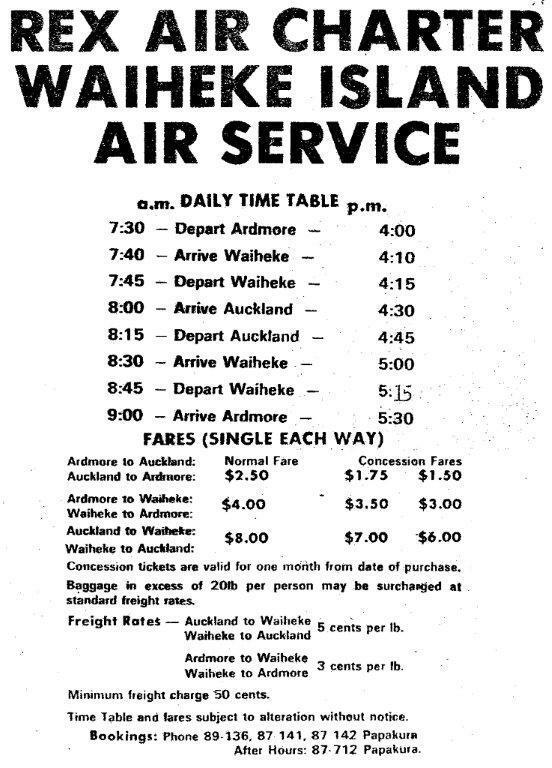 The Ardmore/Auckland to Waiheke Island flights by Rex Air Charter were flown with single engine Cessna 172, 182, 206 or 207 four to seven seat aircraft. 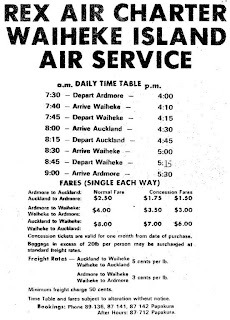 Waiheke Island’s Gulf News of 9 May 1975 announced a scheduled service from Waiheke’s Onetangi airfield to both Ardmore and Auckland International Airport. The Gulf News advised residents the "All seats must be booked and confirmed by phone to the Rex office at Ardmore, the reason being that without any bookings the aircraft will not run until the next timetabled service." Originally two return services a day were scheduled with extra flights operated on demand. Cessna 182 ZK-DFF at Ardmore. Cessna 206 ZK-DOA at Greymouth on 19 June 1976. 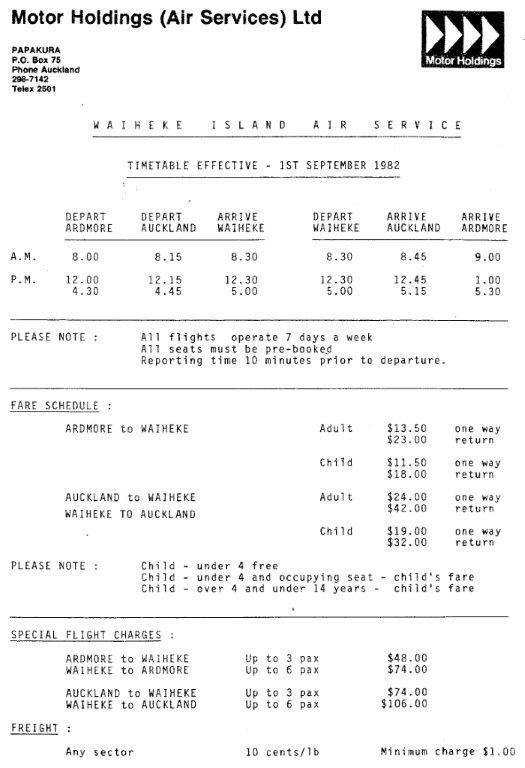 In April 1976 the Ardmore operation was bought out by Dalhoff and King Aviation Ltd which continued to operate the air charter operations, including the Waiheke service, under the title of Rex Air Charter as part of its Dalhoff and King Flying School Ltd. On the 30th of April 1976 Mount Cook Airlines cut their amphibian service to Waiheke Island leaving Rex Air Charter as the sole operator of air services to the island for passengers and freight until Sea Bee Air became operational late that year. Scheduled services were increased to six return flights each day of the week with company also undertaking numerous ambulance flights in close cooperation with St. John Ambulance staff on the island. The Onetangi airstrip was leased by the company from a local land owner and the company erected a small removable shelter by the roadside for “the comfort and convenience of customers.” It was not, however, without its problems. Continual wet weather later in 1976 meant the company had to restrict the number of flights in and out of that airstrip to three per day to avoid further deterioration of the surface of the airstrip. In the winter of 1977 portable emergency runway lighting was funded by the community and this enabled Rex Air Charter to successfully operate Air Ambulance flights at night. While Sea Bee Air’s amphibian service to Waiheke did provide some competition a more serious threat came in the form of a faster ferry service to Auckland provided by a hovercraft and hydrofoil and much late the fast cats. Services, over time, were gradually cut as demand lessened. 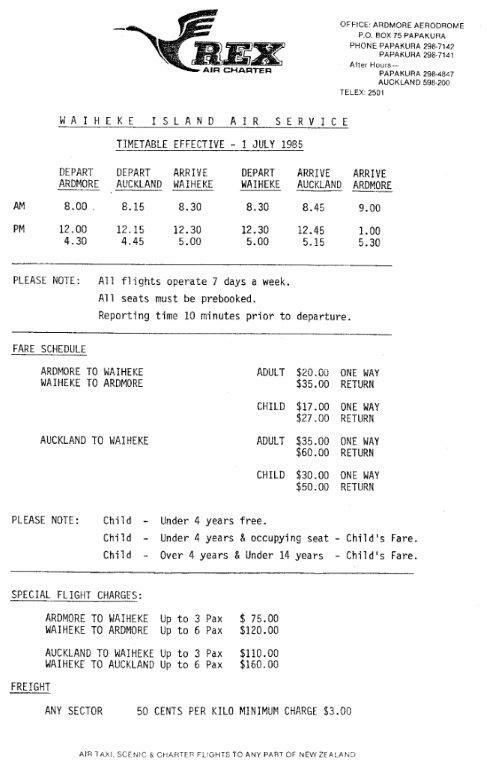 The service boasted a couple of pilots who became identites on the Waiheke run by the number of flights they flew. 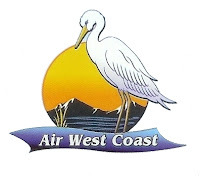 Alvan Treweek flew over 1800 services to Waiheke Island and after he left in August 1978, Bryan Cox logged in excess of 2000 trips. Writing on the Cessna 207, the largest aircraft used on the Waiheke Island run, Alvan Treweek said, "The 207 performed remarkably well. In winter landings on Waiheke, on touchdown full power had to be applied to prevent becoming bogged. Takeoffs with MAUW we’re always tricky, whether to take off uphill with a headwind or downhill with a tail wind. Local knowledge and experience saved the day. I can recall some hair raising moments. Of course this was around 40 years ago, things were different." Rex Air Charter Cessna 206 ZK-EJE at Hokitika in August 1982. 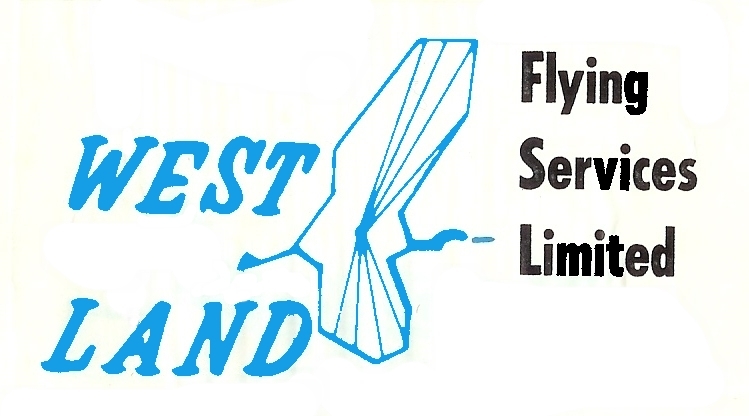 During 1981 ownership of the flying school was passed to Motor Holdings NZ Ltd, which continued to operate its air transport operations as Rex Air Charter until about November 1982. 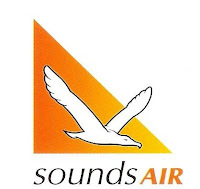 From this time their charter operation was rebranded and operated and flew under the title of its subsidiary Motor Holdings (Air Services) Ltd. 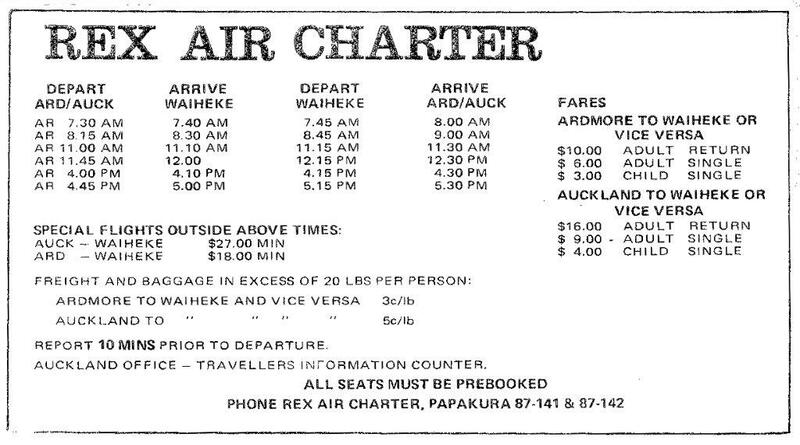 The Waiheke service, however, continued operating under the Rex Air Charter banner. 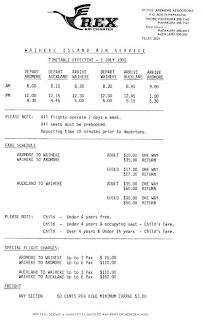 In August 1984, following the withdrawal of the Auckland Aero Club from its Ardmore-Claris service, the company announced in Great Barrier Island's Barrier Bulletin that "Motor Holdings (Air Services) Ltd, who also trade under the name Rex Air Charter, have undertaken steps to commence an air service from Ardmore to Claris and return." The intention was to increase the number of charter flights and then extend the Waiheke service to Great Barrier Island. 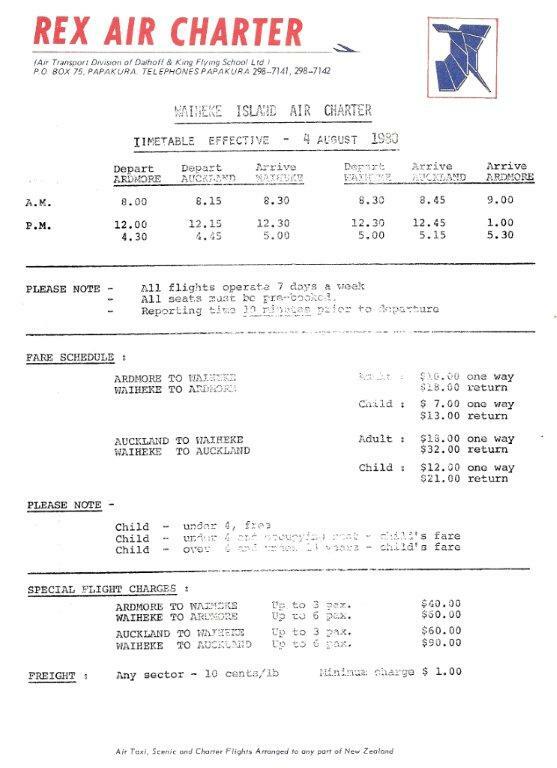 Competition, from Ardmore Air Charter, meant that the service never developed and advertising for the charter service lasted only a few months. The Cessna 207 was the largest aircraft used on the scheduled service to Stonyridge airstrip. ZK-ETC is seen at Timaru on 10 March 1984 wearing both Rex Air Charter and Motor Holdings' logos. Cessna 207 ZK-ETC all loaded up at Stonyridge airstrip for a flight back to Ardmore in January 1985. 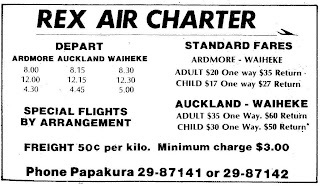 The Rex Air Charter banner finally disappeared from the Waiheke service on the 31st of May 1986 when it was rebranded as Waiheke Air Services, a trading name for Motor Holdings (Air Services) Ltd, a subsidiary of the Motor Holdings Ltd transport group. Brian Sutherland, the airline’s manager, told the Gulf News, "In choosing this name we clearly show our commitment to serving the island's air transport needs for the future." Cessna 206 ZK-EXG at Hokitika on 9 January 1984. Gisborne based Air Charter East Coast Reims/Cessna Caravan II ZK-CEC arrived at Ardmore on the morning of 15 April, this first time I have been able to catch up with the machine wearing its fourth NZ registration marks, the first as ZK-CII from August 1998 until May 1999 with Cityjet (in various forms), then with Vincent Aviation as ZK-VAA from January 2008 before heading to Kiwi Air as ZK-XLC until June 2010 when it became ZK-CEC with Air Charter East Coast (a company associated with Kiwi Air/Farmers Air). 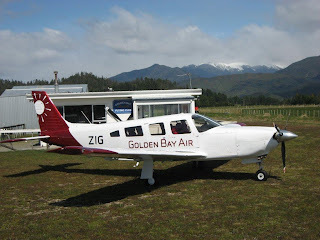 Not the most graceful shot but still worthy of posting is Golden Bay Air's 'new' Piper PA28-181 Archer ZK-ZOG (28-8690010) at Ardmore 15 April. The aircraft was on the NZ CAA register the day this photo was taken. The Ardmore Pilot blogspot has a couple of great photos of Vincent's second Saab 340, ZK-VAB, in its new colour scheme. Once again, a simple white scheme but a dramatic use of the logo makes the Saab look quite sharp. Would be great to see it flying NZ skies. Noted on the CAA register is the addition to the Vincent Aviation fleet of the 3 ex-Air National Jetstreams, ZK-ECI, ZK-ECJ, and ZK-ECR. One wonders what they will be used for! 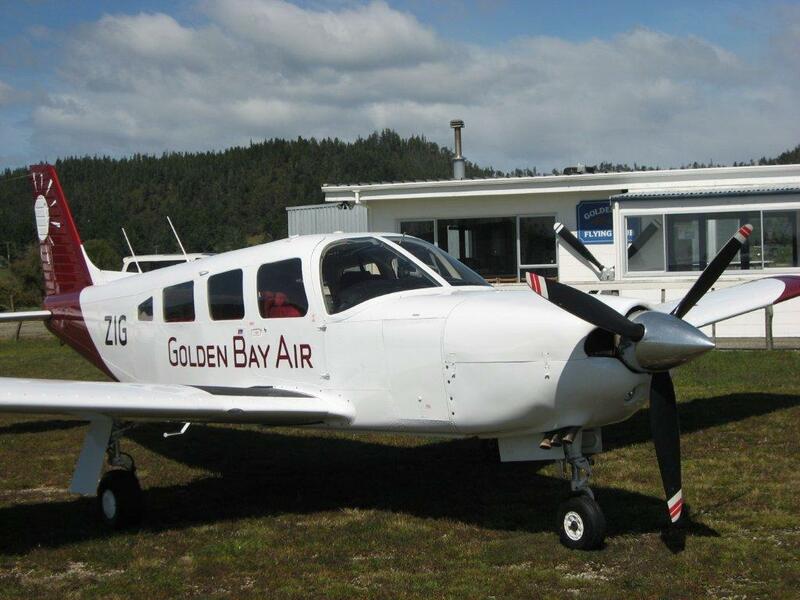 Richard Molly from Golden Bay Air sent me these two photos of Golden Bay Air's Piper Saratoga taken at Takaka in September 2010. It certainly does look a grunty machine and quite sharp in this scheme. I look foward to seeing ﻿the new Seneca, ZK-ZAG in a similar scheme. The new Archer, yet to be registered ZK-ZOG, which replaces ZK-EQS will remain in its existing scheme (see http://3rdlevelnz.blogspot.com/2011/04/zig-zag-zog-golden-bay-air-update.html). On 10 February 2010, ZK-TZR, a Cessna C208 aeroplane, had just taken off from Nelson Aerodrome on a scheduled commercial flight to Wellington when the pilots noticed a reduction in engine performance and a strong smell of fuel in the cabin. There were 2 pilots and 4 passengers on board at the time. The pilot contacted the aerodrome controller and arranged for the flight to return to Nelson; he did this without declaring an urgency or distress situation. The aeroplane made a successful landing back at Nelson, with the engine still operating on reduced performance. There were no injuries and no damage to the aeroplane. The Transport Accident Investigation Commission (Commission) found that the reduction in engine performance was due to fuel leaking past damaged o-rings that should have sealed fuel being delivered to the engine. The o-rings had been damaged by movement of the fuel-transfer tubes, which had been reduced in size at some time during maintenance by a chemical milling process that had removed the anodic protective coating. The Commission also determined that the pilots should have declared an urgency or distress situation to ensure that emergency services were on standby in the event of a different outcome. The Commission also found that the Civil Aviation Authority of New Zealand (CAA) system for classifying accident and incident notifications needed reviewing, because the potential seriousness of the defect that led to the forced landing, while initially recognised, was incorrectly classified and not assigned for investigation until 2 months after the Authority was first notified. Actions taken by the CAA to address the safety issue regarding the classification of occurrences meant that no recommendation was required to be made. A recommendation was made to the Director of Civil Aviation regarding the use of correct radio telephone phraseology in the event of an emergency. Effective 1st April 2011 there have been some major changes to our Tauranga operation. All commercial / air transport operations have been relocated to our Auckland operation where possible. All flight training operations have been resumed by Tauranga Aero Club. Previously Air Discovery had a Rotorua and operated the NZ Herald newspaper run from Rotorua to Gisborne. 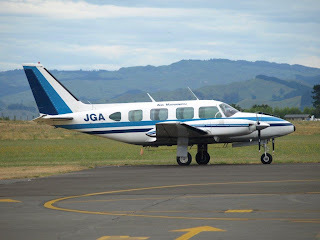 More recently from Tauranga it operated a scheduled air service to Motiti Island, an around the East Cape on an unscheduled, as-required flight service that links Tauranga, Whakatane, Opotiki, Waihau Bay, Ruatoria, Tolaga Bay and Gisborne and a transfer service to Slipper Island. It currently operates transfer services between Waiheke Island and Auckland and Great Barrier Island. 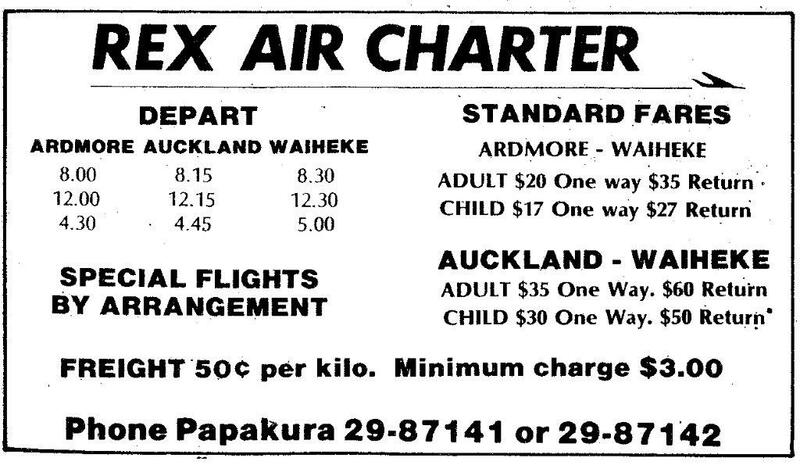 This post, written by Bruce Gavin, gives a background to Rex Air Charter who in the 1970s and 80s ran scheduled services to the West Coast and Waiheke Island. These services will be the subject of the next two regular Sunday historical posts. Rex Air Charter’s origin was in Rural Aviation Ltd in New Plymouth. Rural was formed by Miles King, who during World War II had been an RNZAF Corsair pilot in the Pacific. He formed Rural Aviation Ltd on 16 December 1949 and the company became one of the pioneers in aerial topdressing in New Zealand, initially flying converted DH.82A Tiger Moths. Miles King was keen on expansion and the company grew steadily. 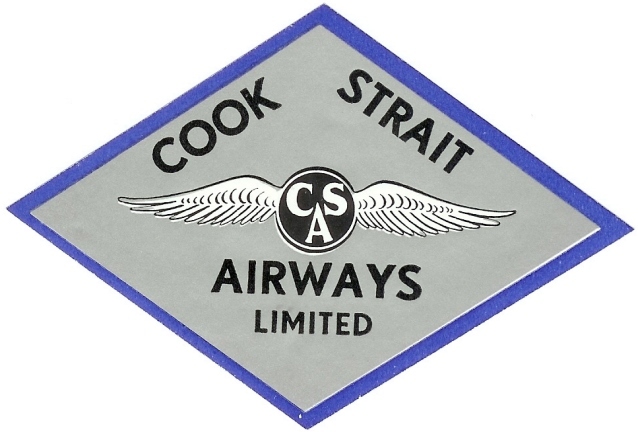 A major move was in 1953 when he gained the agency for the Cessna range of aircraft for Australia, New Zealand and the South Pacific. To cater for the greatly expanded business a separate public company, known as Rex Aviation (NZ) Ltd was formed and Rural Aviation Ltd became one of its subsidiaries. Headquarters were established at Ardmore and later a smaller South Island base at Dunedin's Momona Airport. 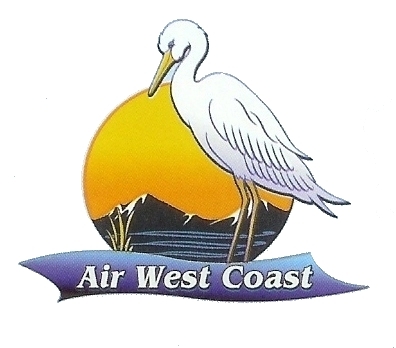 To increase aircraft sales and servicing the company took over the Ardmore based Auckland Flying School Ltd (which had been established by Jim Bergman and Earl Cox). This became known as the Rex Flying School. Further flying schools were either bought or established at Paraparaumu, Christchurch and Dunedin. 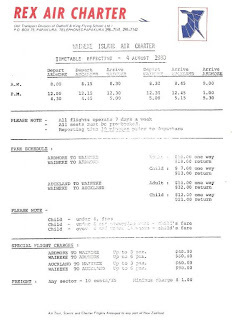 Air charter operations were operated as an adjunct to the flying schools and ultimately there was to be air services operating from two of these centres. In Paraparaumu the established Paraparaumu Flying School was taken over by Rex with Harry Jenkins managing this operation. 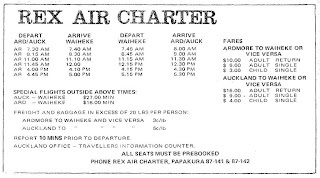 Rex Air Charter became the air charter service operating beside these flying schools with Rex Air Charter developing regular air services between Ardmore and Auckland Airports and Waiheke Island and from Paraparaumu to the South Island’s West Coast.